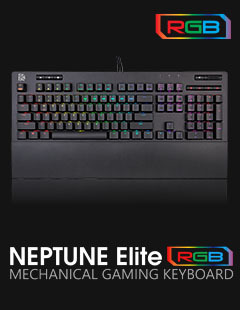 The NEPTUNE ELITE RGB gaming keyboard comes in a unique floating keycap design with premium grade finish that delivers 16.8 million RGB color illumination with 14 lighting effect modes for a truly enhanced gaming atmosphere. 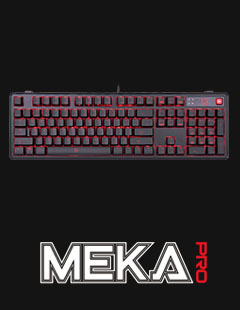 Packed with features including: dedicated volume/mute & multimedia keys, USB pass through port, 5 pre-configured FPS1, FPS2, MMO, MOBA, RTS lighting zones, 100% anti-ghosting, n-key rollover, detachable wrist rest, and 8 included additional red keycaps, it offers maximum customization with ultimate simplicity to suit all your gaming needs. 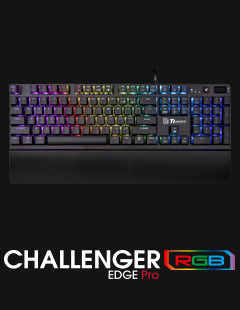 The Challenger Edge Pro RGB gaming keyboard comes in a unique floating keycap design with a sleek minimalistic aluminum finish. It delivers per key backlighting of 16.8 million true RGB colors and comes with 13 dynamic lighting effects for a truly enhanced gaming atmosphere. Packed with features including: 5 pre-configured FPS1, FPS2, MMO, MOBA and RTS lighting zones, anti-ghosting, n-key rollover, detachable wrist rest and dedicated volume & mute controls, it offers maximum customization with ultimate simplicity to suit all your gaming needs. The CHALLENGER EDGE – Comes with a brand new floating keycaps design, delivering stunning colors under each keycaps that provide gamers a more attractive and in-style look while gaming! Additionally, it was created with a splendid black brushed aluminum faceplate and laser engraved keycaps that makes it cooler and more extraordinary! 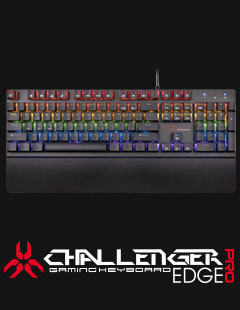 The Challenger Edge Pro gaming keyboard comes in a unique floating keycap design with aluminum finish and delivers 6 multicolor illuminations with 9 separate lighting effects for a truly enhanced gaming atmosphere. Packed with features including: 4 pre-configured FPS1, FPS2, MMO, MOBA lighting zones, anti-ghosting, n-key rollover and splash resistance, it offers maximum customization with ultimate simplicity to suit all your gaming needs. The POSEIDON Z Touch – Engineered with a special spacebar that can be touched, swiped and programmed, making a capacitive touch sensors in the keyboard; Perfect for both mechanical keyboard user and a gamers enthusiast. 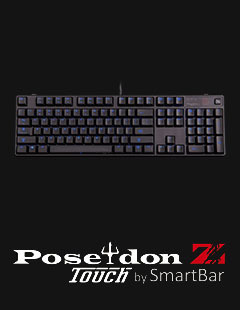 The POSEIDON Z TOUCH input this amazing Smartbar Technology to this keyboard enabling a more compact gaming keyboard without any loss of functionality! 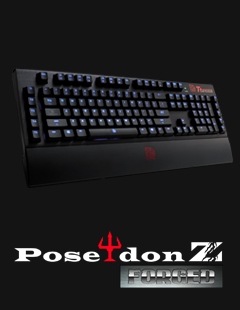 POSEIDON Z TOUCH also comes with our Tt eSPORTS Certified Mechanical switches, rated for 50 million keystrokes, & the world’s first 5 Year Warranty on a mechanical gaming keyboard! 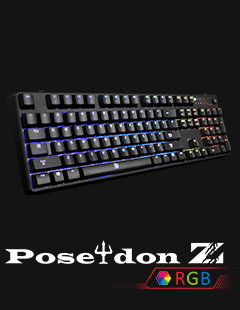 The POSEIDON Z RGB Gaming Keyboard – A simple yet astonishing spectrum keyboard; it offers extreme customization options for users to play with, energizing you with the colors to take gaming style to the next level with experiencing the colorful of life. 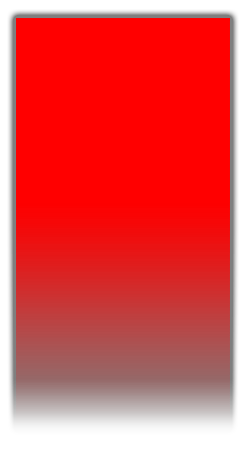 With the layering and colorbar concepts, our basic customizable backlighting has been evolved for extreme customization. It gives a spectrum of visual effects featuring 16.8 million colors and provided users the easiest way to tune and most importantly, it colors up your life! 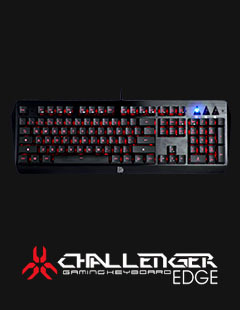 The CHALLENGER Prime membrane gaming keyboard packs a whole lot of features at a budget friendly price. The backlighting system features red, blue, and purple LEDs for static and pulse lighting; Brightness can further adjusted via the dial in the front center of the keyboard. 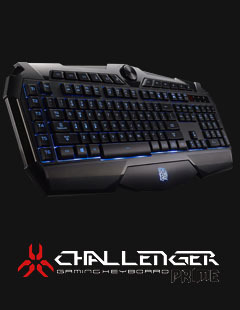 As with the CHALLENGER series of keyboards, the CHALLENGER Prime also features onboard memory for setting the dedicate macro keys. 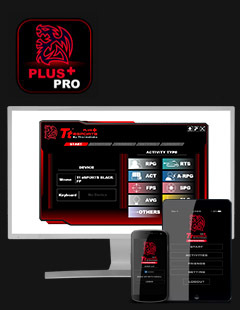 In addition, there are multimedia keys, shortcut keys, repeat rate and poll rate adjustment keys. If you’re on the search for a pro gaming keyboard that allows you the ultimate playing experience with features like floating keycaps, illuminative colours, pre-configured lighting zones and ant-ghosting technology? Then, well, here you have it. The crazy collection of TteSPORTS mechanical gaming keyboards are the perfect way to improve your gaming experience in ways you never thought possible. 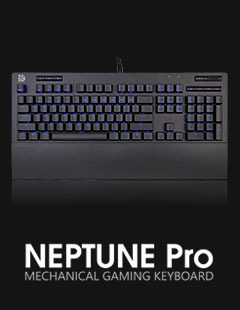 We design and manufacture the top gaming keyboards available on the market. Put that cheap, old keyboard in the trash where it finally belongs and pick up one of the best pieces of technology available – a TteSPORTS gaming keyboard, available for purchase at our online store. We provide delivery on our technology throughout Australia. So, if you’re located in Brisbane, Melbourne, Sydney, anywhere, simply place an order for one of the awesome little pieces of pro gaming technology and we’ll have it delivered right to you, ready to go. With our team of experienced, professional designers who have a genuine passion for creative development, TteSPORTS has established itself as one of the newest big players in the gaming industry. Our dedication to new, cutting-edge technology separates us from those developers who are falling behind in the gaming development game. If you want to learn more about the cutting-edge gaming keyboards we design and manufacture here at TteSPORTS, or have an enquiry about a particular product, please don’t hesitate to get in contact with our team. We’re always here to provide extra advice about our awesome range of equipment and will be happy to answer any questions you have. Send us a message via our contact page and we’ll get back to you in no time.